Our mission is to meet every customer’s unique needs, from project conception to completion and beyond. Our team delivers what you need when you need it. Most importantly, we do not just talk about projects; we have done the work. 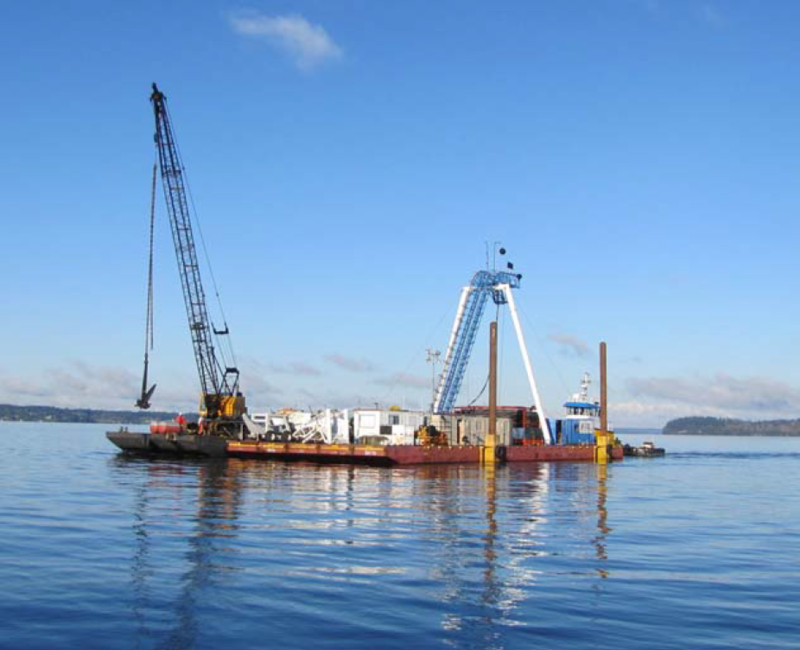 General scope of the project: In summary, this project consisted of providing the services and equipment necessary to install approximately 13,000 feet of marine cable between Luhr Beach and a point on the South end of Anderson Island, WA in accordance with applicable permits and technical requirements furnished by the owner and its engineer. 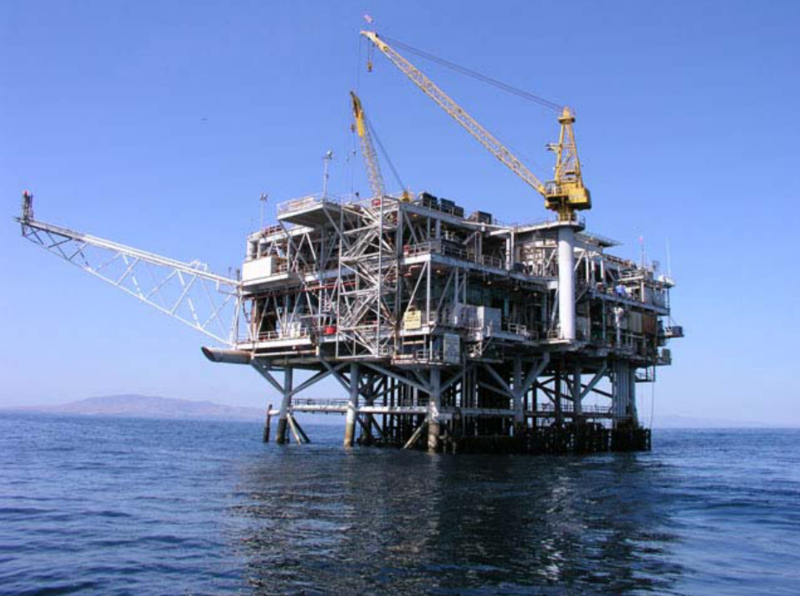 The nature of the work that was performed: Harbor Offshore, Inc. managed and coordinated all aspects of this project; coordination of horizontal drilling operations, vault installation and final testing of submarine cable. 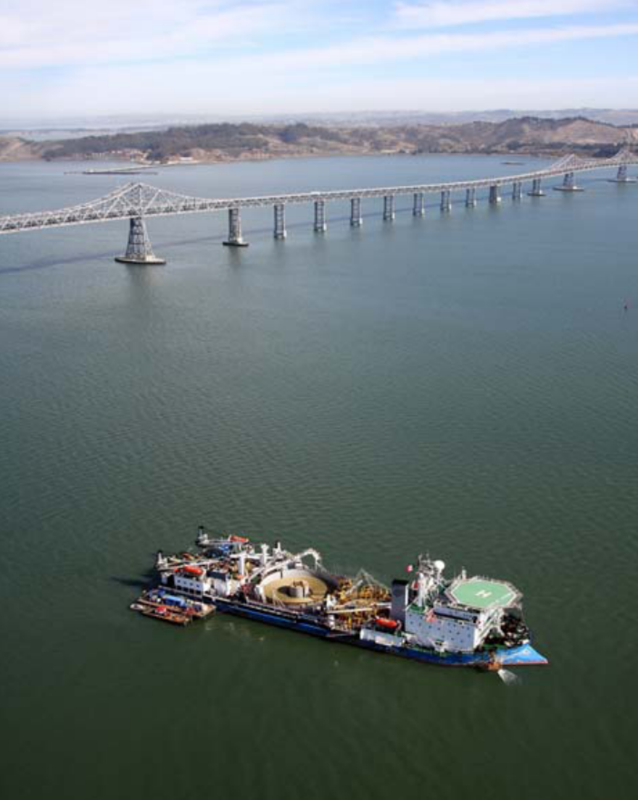 HOI utilized its specialized cable lay installation equipment, barges, ROV’s and dive support vessels to lay the cable within its prescribed corridor. 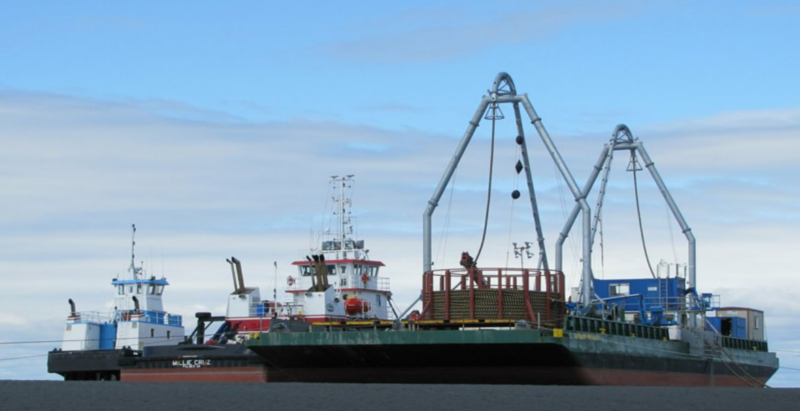 In May of 2012, Cook Inlet Regional Inc. contracted with Cruz Construction of Palmer, Alaska to install two, 18,000 foot, 3-core single armor, 35 kv power cables between Anchorage and Fire Island as feeder cables for a new wind farm. The crossing was tidal, with a 30 foot range. The barge would be dry twice a day and land based burial equipment would bury the cable at low tide. 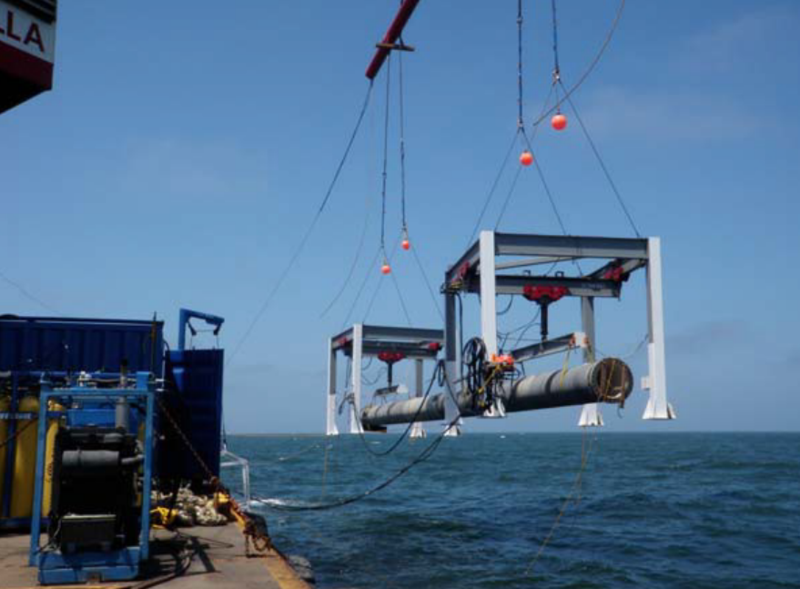 General scope of the project: Harbor Offshore, Inc was contracted to assist in the installation of 53 miles of submarine cable from Pittsburgh, CA to South San Francisco, CA. 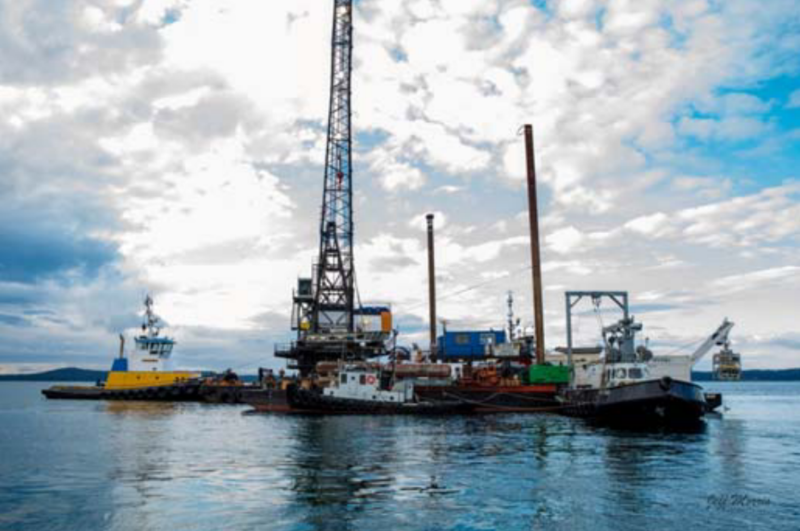 The nature of the work that was performed: Harbor Offshore, Inc. provided six shallow water and deep water dive spreads crewed for 24/7 operations within a week’s time to support the laying of 53 miles of submarine cable. 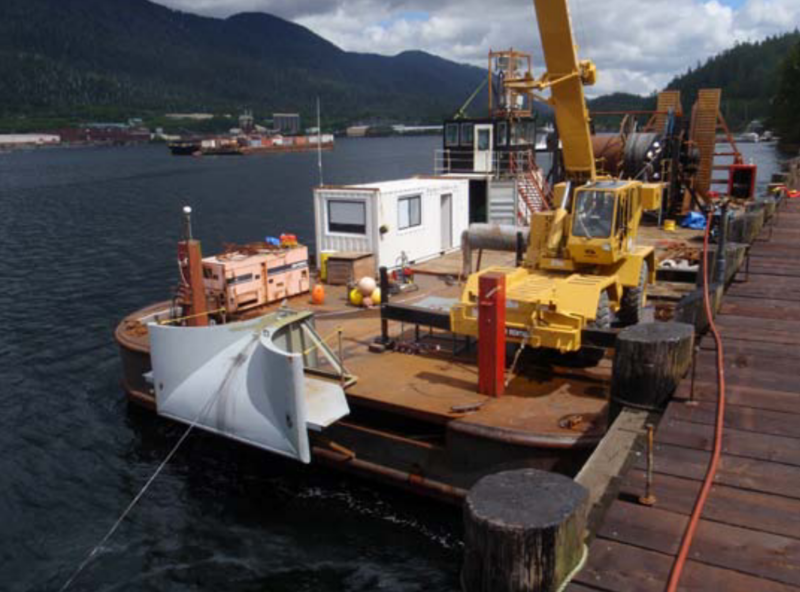 These operations included cable sled installation and retrieval, surveying, u/w video, sub mar mat placement, and extensive cable burial operations performed by hand jetting. 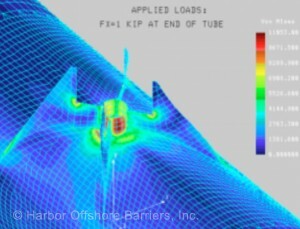 Harbor Offshore provided highly valuable technical support during planning and execution of this project. 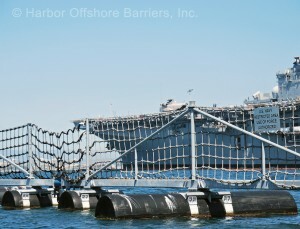 Personnel with Harbor Offshore participated in the mobilization of equipment and the on-water installation. 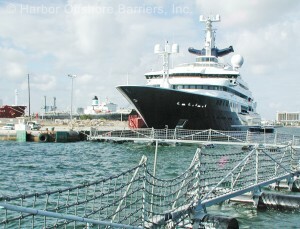 SAIC personnel installed the array and Harbor Offshore installed the umbilical’s and shore cables. 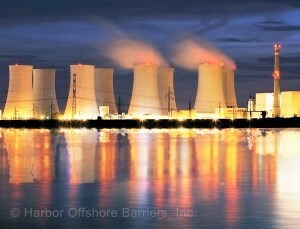 Harbor Offshore provided the key members of the submarine cable team, during all phases of the installation. Install (2) shore connections consisting of a 1645 foot umbilical, 10,000 lb clump weight in 1400 feet of water and a 30,000 foot power and data cable to shore on Back Island. mobilization of equipment and the conducted the successful on-water repair. This involved the utilization and direction of numerous subcontractors with equipment and specialized capability in use of dual tractor tugs, hi-current ROV, derrick barge, acoustic subsea positioning, surface positioning, mixed gas diving and fiber optic splicing. 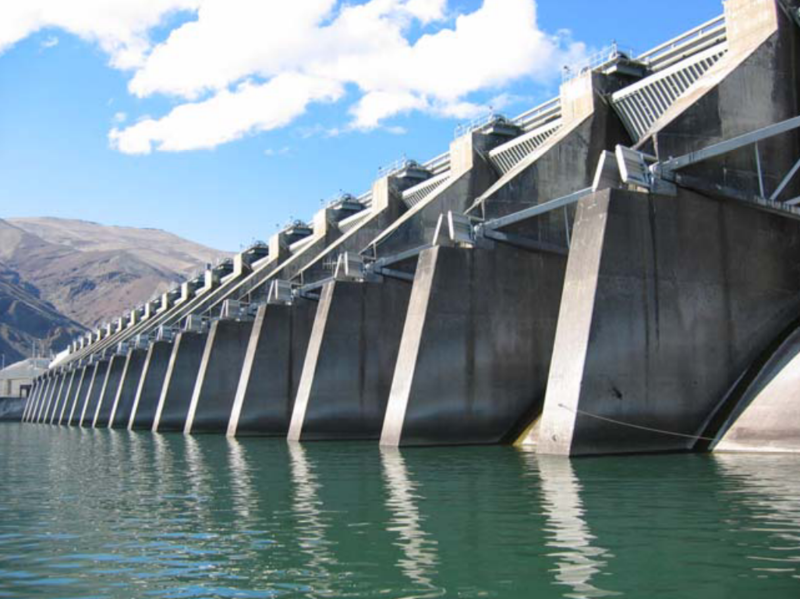 Provide commercial dive labor, equipment, and materials in support of underwater operations involving the installation of gas deflectors on the face of the dam. HOI personnel incorporated the use of lasers, drill templates, hydraulic and pneumatic tooling, U/W video equipment, U/W burning and welding techniques, and provided the necessary experienced dive personnel to assist in demolition, rebar installations, form work, and all the other facets involved in this highly diver involved project. 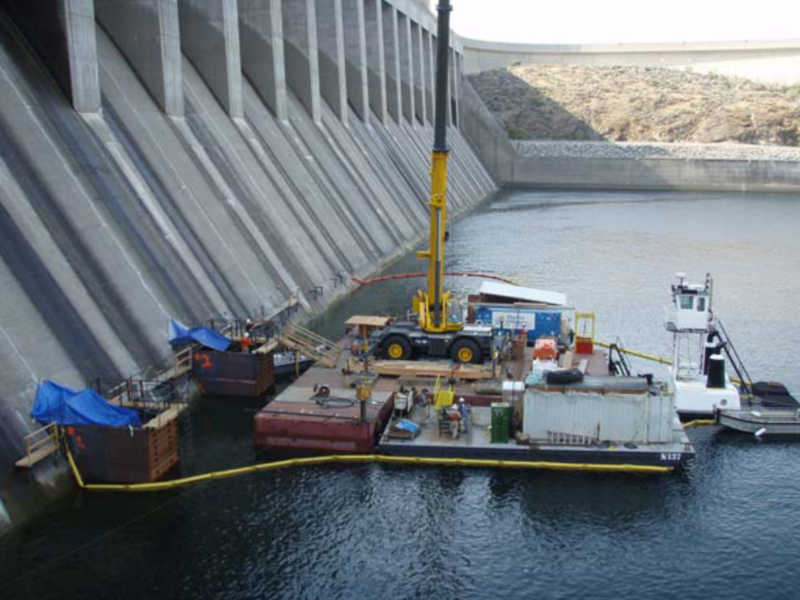 Some of the work encompassed asbuilding to confirm designed component fit, structural analysis, identification and removal of formwork, rebar installations, extensive concrete core drilling and concrete repairs, numerous installations and sealing of cofferdams and bulkheads. HOI worked extensively with project engineers to ensure the installation of the gas deflectors and associated pieces would fit correctly at their precise destination. Installation of an 800’ x 24” HDPE submarine ocean outfall. 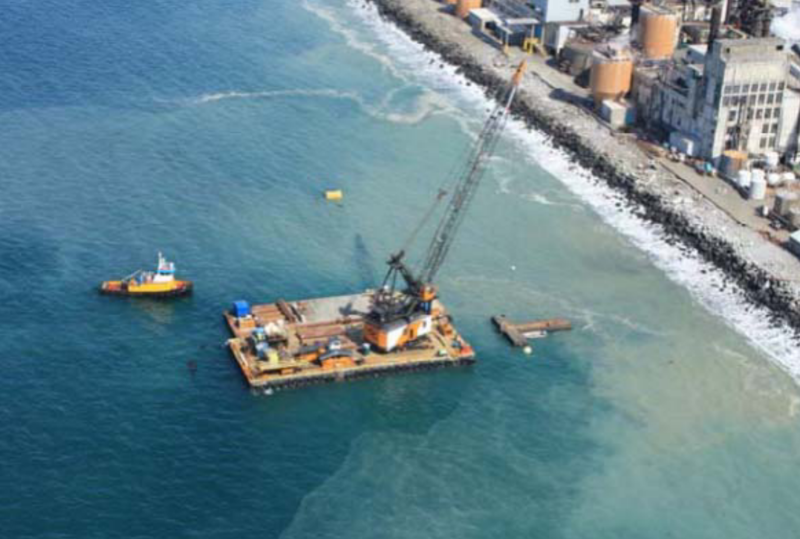 In the role of prime contractor, HOI coordinated overall efforts including the project QC/QA program, SWPPP program, subcontractors, vendors, performed offshore sheet pile driving, dive operations, tug operations and overcame unique project logistics and inclement weather issues. 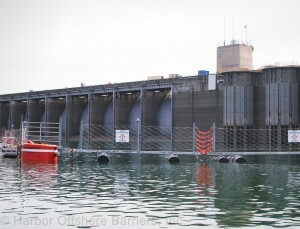 HOI was awarded a contract for the removal of debris on the dam spillway and repair of the damaged concrete within the seasonal fish closure timeline without posing a threat to the sensitive environmental zones adjacent to the project site. HOI personnel were tasked with conducting various modes of underwater construction in order to meet the stringent project timeline and meet the client’s needs. HOI divers conducted underwater surveys, removed 8’+ boulders from the project site, conducted 25k hydroblasting operations, performed numerous pneumatic chipping/drilling patterns, installed rebar cages, installed/custom fit forms as needed , and conducted sequential underwater concrete pours utilizing boom trucks to deliver grout to limited access locations. Installation of a 4600’x 30” weight coated outfall pipeline and diffuser section. Divers assisted in HDD operations, surveyed and constructed HDPE transition template, installed transition spool piece, surveyed ballast rock installation, and installed 32- 80’ spool pieces to complete outfall installation. These operations required surveying, u/w video, and extensive use of custom built hydraulic horses to assist in flange-ups in various sea states. • Corrosion Inspection at five members per level. This work was completed safely and efficiently using compressed breathing air for all diving work down to (-) 165’ and compressed gas (14% oxygen and 86% helium) from (-) 165’ down to (-) 300’.